I had to meet an inspector in the city at Mummu and Grandpa's future home, so Kenny went to their place. 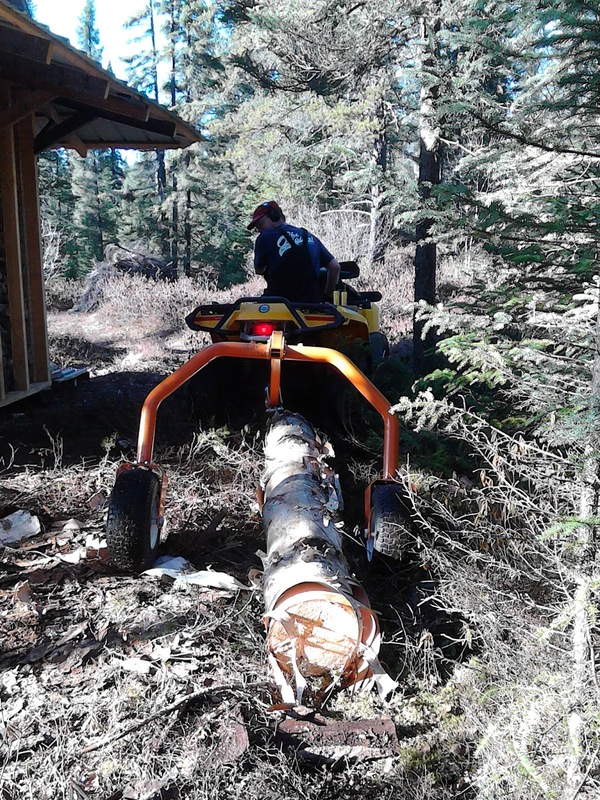 After that I went straight to an IT call out towards Hawkeye Lake with a really nice new client. 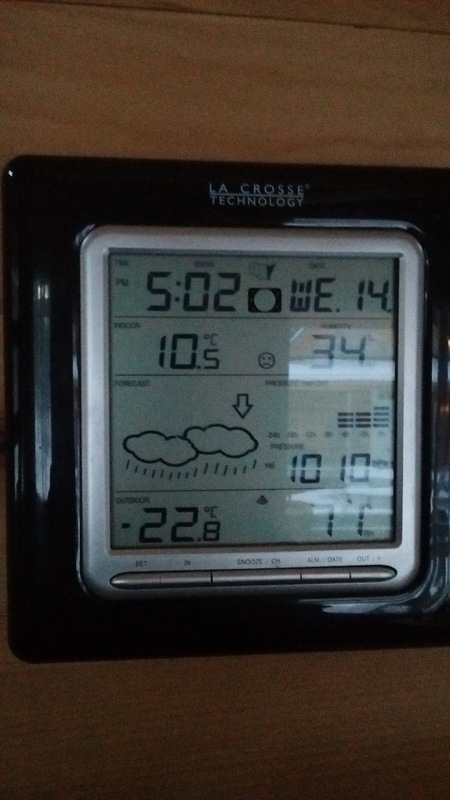 By the time I got back to the cabin, this is what Kenny and I had to deal with: 10.5 degrees Celsius indoors! My friend JC! particularly likes the sad emoji. It's now almost three hours later and up to 21.3 degrees inside. I'll let my editor say if we need to keep stoking the fire. [Editor: Sorry I missed posting this at the time it was written. I think we did keep stoking the fire, because the night got progressively colder. Some nights since then have gone down to -28 and -30 degrees Celsius. 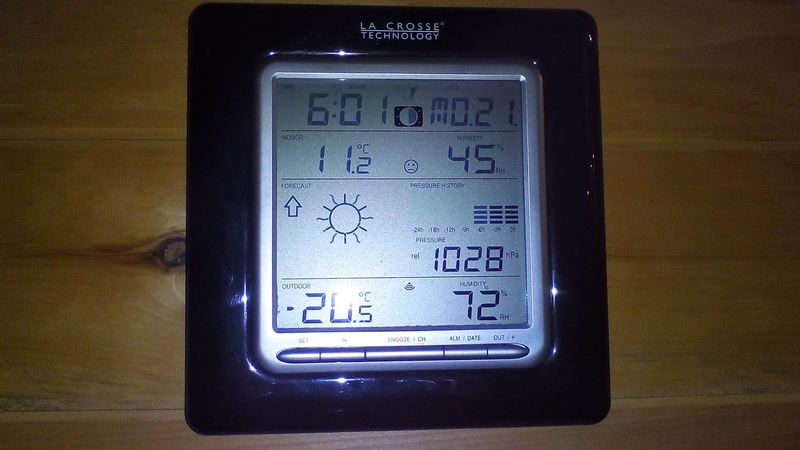 Fortunately, even with the fire going out at night, the morning temperature indoors was never colder than this. Now the temperatures are mild again; it's only -7.8 degrees outside today before dawn. 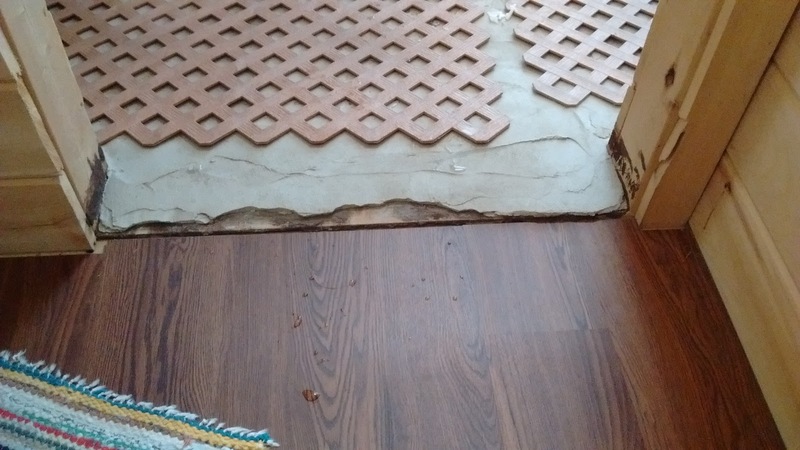 The parging in the sauna floor has performed very well over the past few years since the C! family helped us to update it from the craptacular finish I had originally attempted to use. 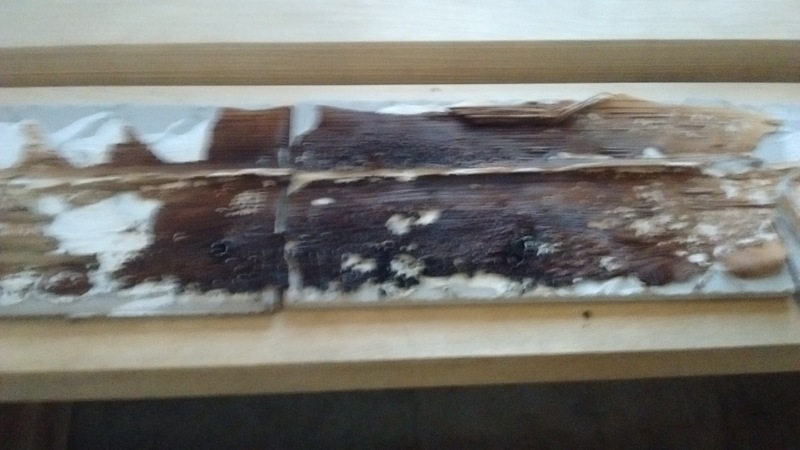 But as was its wont, it cracked and crumbled at the edge where it ran thin as it transitioned into the change room. 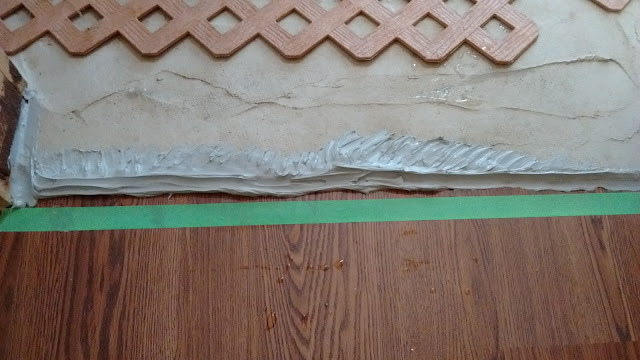 Finally I bought some grey caulking, and goobered up the area. Using my finger as a trowel, I tried to get it to resemble the original parging as much as possible. I think I did a pretty good job for such a situation. The next day though, it still hadn't dried while we took sauna. I kept the sauna curtain open to try to warm up the whole building and give it more time to dry correctly. Hopefully by tomorrow's sauna it will be able to withstand someone treading on it. 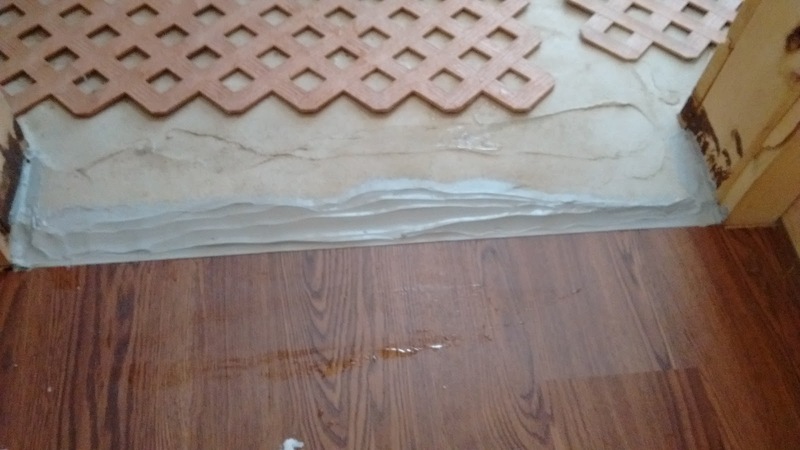 You can see where the parging has broken away. Lots spread in to cover the gap. And made to look more like the original! 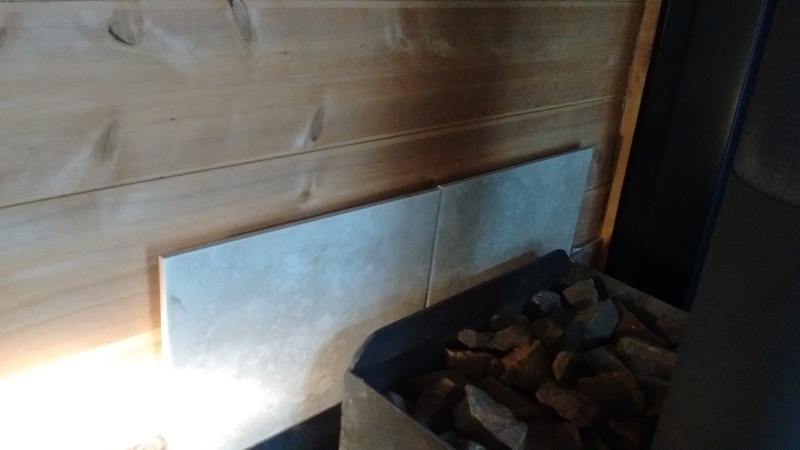 So, as faithful readers know, I have been engaged in an ongoing campaign to ensure that the sauna stove doesn't end up burning down the sauna itself. 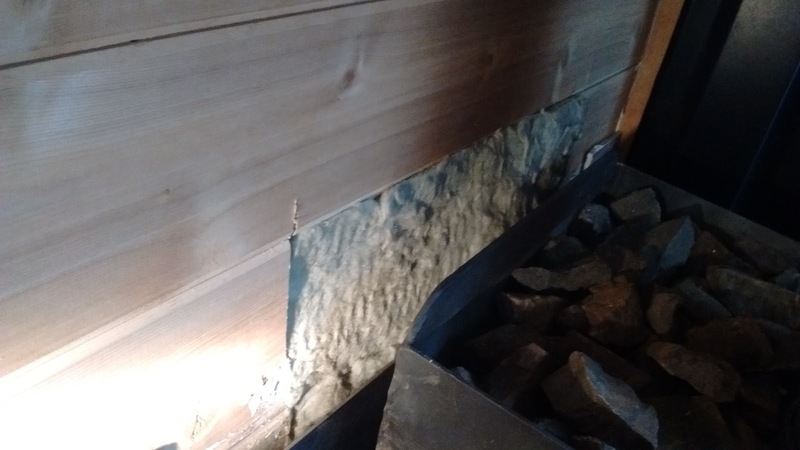 Once again, even after trying to insulate the wood from the heat of the stove by putting tiles between the metal plate and the wood, I found a creeping darkness working its way up from the top of the stove. I don't like the look of the shadows here. 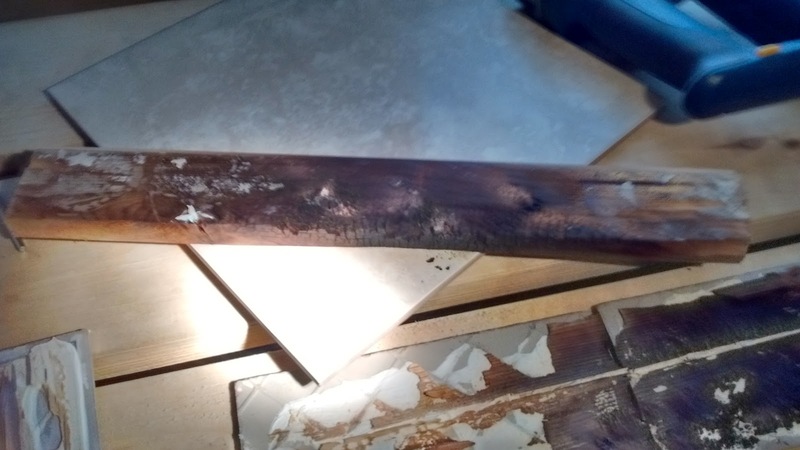 I loosened off the plate at the top of the stove, and then used a screwdriver to peel off the centre three tiles. Sorry for potato quality. Lots of ash on the back of the tiles. 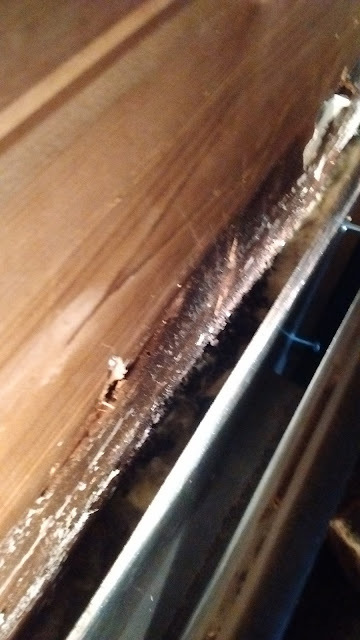 Looks a bit rotten down there behind the steel. 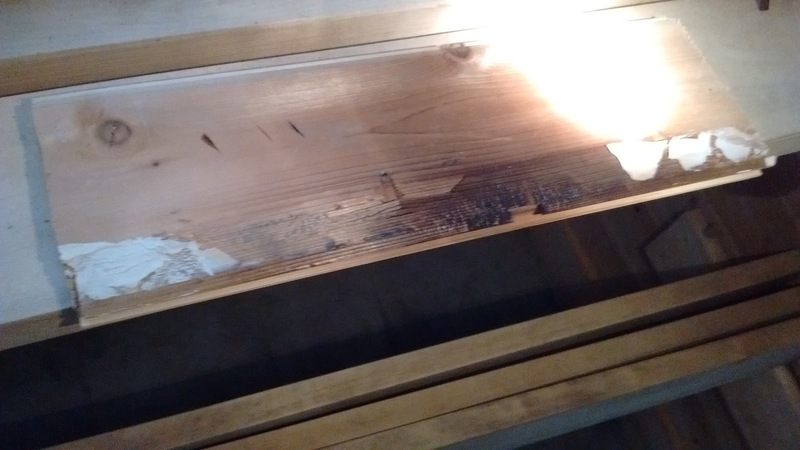 Then I used my reciprocating saw to cut the cedar v-joint up about eight inches higher. Haven't used this baby for awhile! You can see that the v-joint was getting pretty scorched. Rats. 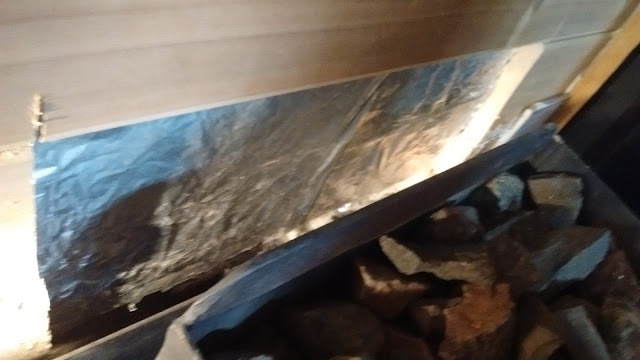 I lifted the foil and the logs in behind didn't show any new scorching. 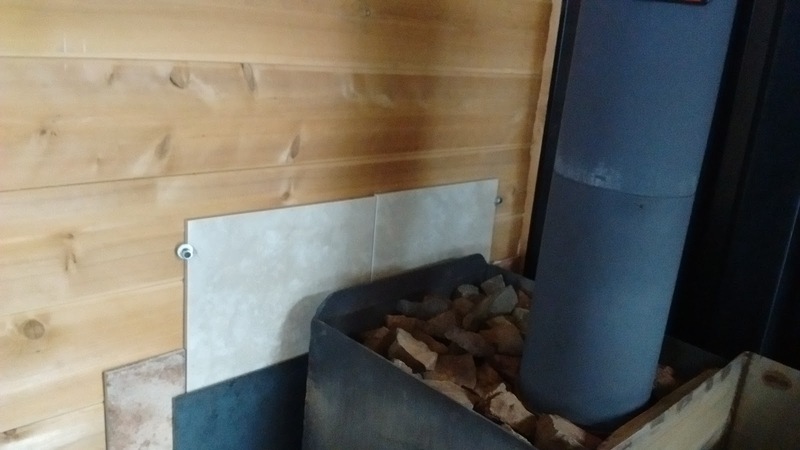 I packed the space with some Roxul, and then replaced the two small tiles with two large ones from my spare pile for around the woodstove. 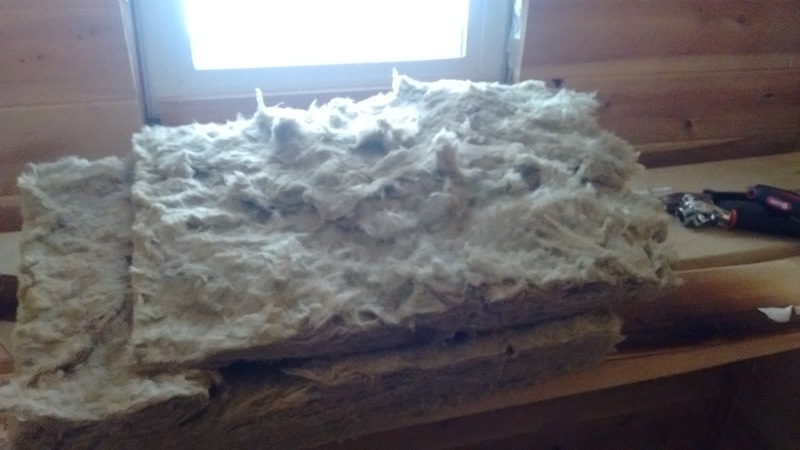 A split batt of Roxul insulation. And fit in where the v-joint previously rested. Some caulking to hold the tiles in place. Looks okay, but they tilt away from the wall. A couple of washers on screws to hold the tiles in place, and I was back in business! A few washers and screws to hold them in place. Maybe to be upgraded with something more aesthetic someday. Looking okay again now - but for how long? Bonus picture of a cold morning inside the cabin. Whelp, me not so smart. For starters, the Chinese bubbler was awesomely cheap and worked well for such low power. It also was stunningly poorly constructed. On top of the shoddy quality, I foolishly installed the pump INSIDE the well. So after only a few days, it rusted completely out and died a premature death. I ordered a second one (for the fish pond), so when it arrived, I decided to try to use it for the well (our priority) but with a better setup to protect it. I untwisted them, wrapped them in electrical tape, and then used a glue gun to cover the entire shebang. 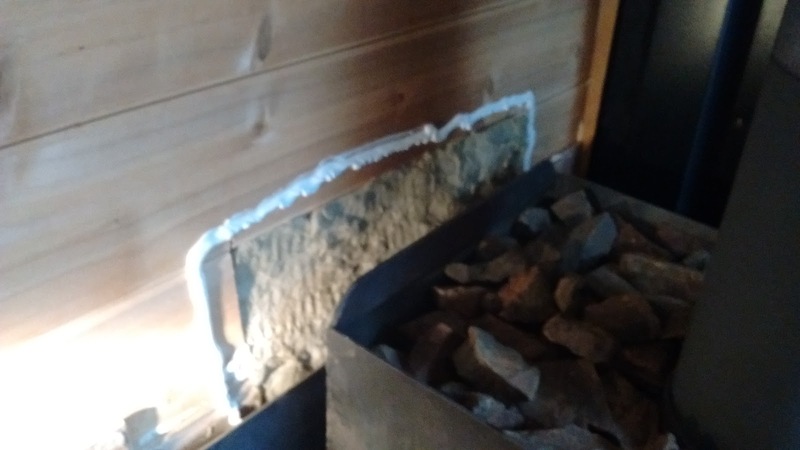 Trying to insulate with electrical tape. Hopefully the wires are well separated now. Hot glue for the win? Then I took a small container, and drilled holes in each end of it to accommodate the USB cable and the air hose. This container was a plastic Lock N Lock style item, which should hopefully protect the pump a bit better. This looks to be the right bit. A larger hole down here for the USB plug. Doubled up the length of the hose, and added the pump mounts to make it firmer in the box. Everything assembled at the well. 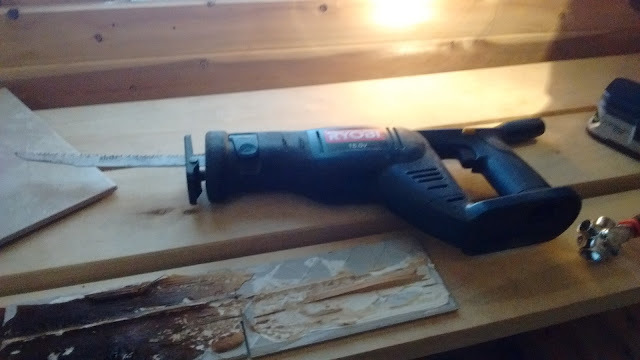 I then purchased a cork that better fit the hole and air hose. So now I put the pump just outside the rim of the well, and ran the air hose through the casing and into the well. I also connected the two hoses together to allow it to sink even further into the well. Hose is in the well now. Finally I hooked it up to a solar panel, which under full sun powers it just fine. Meanwhile, the pond was frozen over! So I was cleaning out our bedroom the other day, and happened to find underneath some components, a cheap Android tablet I purchased a year or two ago for Donna to try out (and maybe for Kenny to favour over the iPad or netbook). It had gradually been getting flakier and flakier, and I knew the last time I used it, it appeared that someone had sat on it or something, as the back cover had popped partially off and took a bit of effort to snap back on. When I picked it up this time, it was completely apart in layers. Screen, front cover, circuit board and back cover were all simply stacked on one another. This was really odd. I couldn't figure out how it had happened spontaneously. One of these batteries is not like the other. No wonder the tablet no longer took a charge! Straight to e-waste recycling it went! Here are a couple of bonus super-moon pictures. We've been enjoying popcorn quite a bit lately. I have been experimenting with some of those "Kernels" flavours you can purchase at the store, and have actually found my favourite to be just something called "butter salt" or "popcorn salt" from the local bulk store. It makes my popcorn taste just like theatre popcorn... A guilty treat. I flirted briefly with popping the corn in our microwave this summer, just using a paper bag, but didn't really feel any love for the results. So we've been making lots of popcorn on the butane stove, or lately, the woodstove, just in a saucepan with a lid and some oil, and lots of shaking. Unfortunately, on the butane I always feel precarious - I don't want to knock the stove itself onto the floor with all the vigorous shaking required. 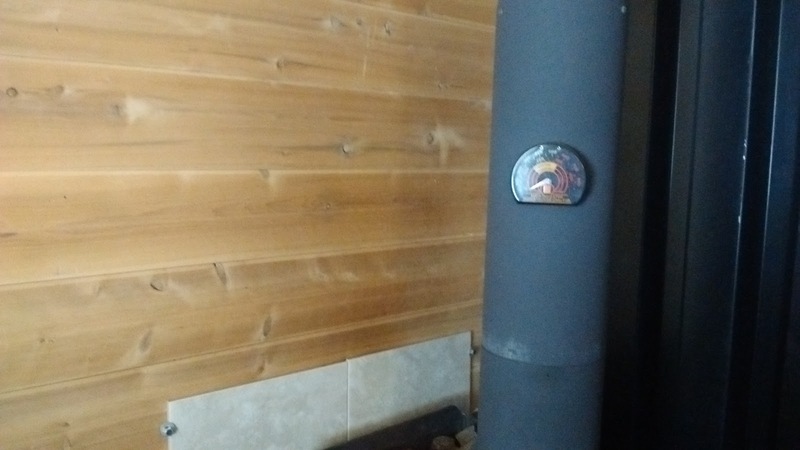 I also noticed that now that the colder weather has begun and we are making it on the woodstove, my shaking has put loads of scratches into our stainless steel stovetop. Another detraction. I noticed that there are several companies that sell popcorn poppers with an agitator on a crank mechanism that stirs it while on the stovetop. Again, they are mostly aluminium, but I realized that there are a few that are stainless steel and include some sort of magnetic plate to allow them to be used on an induction stove. This would let us continue making our treat throughout the summer too. I didn't for a second consider making anything on our glasstop induction cooker that required much shaking! I did some checking of Amazon reviews, and finally decided on the "Home N Cook 6.5Quart" popcorn maker (this is an affiliate link, FYI), and in a moment of weakness and commitment to substitute popcorn for my normal potato chips, I ordered one up. After a couple days, it duly arrived in the city, and Kenny and I picked it up after one of our coding sessions at the Waverley Library Auditorium (Thursdays from 1 to 3pm - all are welcome to come out and play or make computer games and apps!). I unboxed it, washed it up, and gave it a try. Ready for the grand unveiling! Hmmm, a big hole in the side of the box, luckily no damage to be seen inside. A kernel in the oil waiting for it all to heat up. And the unit assembled and ready to crank. Some of the hulls look a little too toasty here. I was less than impressed. Many unpopped kernals, and the ones that did pop were getting close to being overdone. The husks were a dark, dark brown. Of course, the popcorn salt covered up any dodgy flavours, so it wasn't a complete loss. After sinking in the $50 though, I wasn't prepared to give up. Since then, I've learned a few things to improve the experience. First off - a good amount of oil helps greatly. Don't be stingy. Also, for the first batch, put in the oil with maybe three or four kernels. Once they pop, THEN it is warm enough to put in about a quarter cup more. I make small batches - I think that if you put in too many, you lower the temperature of the oil too much, and in bringing it back up to popping temperature, that's when you can scorch things. I turn the crank a few times to coat the kernels, and then when it is popping, I turn it one rotation, wait to hear pops, and if I hear some within about four or five seconds, I crank another rotation, until I no longer hear pops... That usually does a good job of ensuring that they all get popped, without burning anything. So for the three of us, I usually do three batches in a row, seasoning each batch as I go. That's a quarter cup per batch. We usually eat about two thirds of it, with another container to snack on the next day. I'm happy with it, but if it weren't for the scratches in my stovetop, I think I'd probably stick with a saucepan and shaking it. It is challenging to clean. Lately I have been putting an inch of water in it when we finish using it and putting it back on the stove so that the oil more readily comes out. It still takes a bit of nibbling with the dishrag to get into all the nooks and crannies presented by the paddle and gears. Still, we're getting good popcorn production, and I like to believe that even with the salt and oil, it's better than commercial potato chips. Subsequent batches are getting better! Whoops! 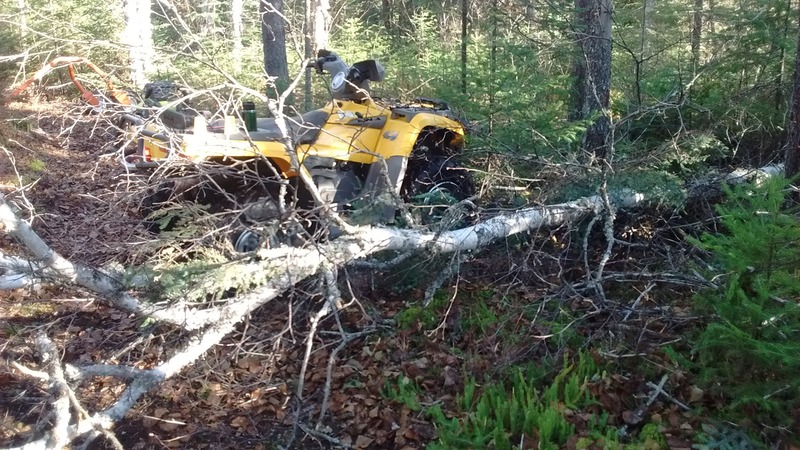 ATV Almost Squished by a Falling Tree! 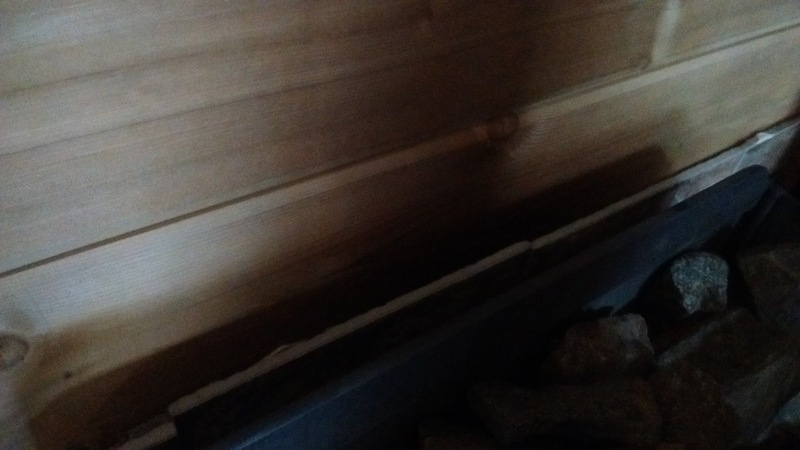 With the woodshed full of this year's wood, I've been trying to get way ahead of the curve and have most of next year's wood already put up. One of the things I've been striving to do has been to get more birch into the mix, to see if it really burns so much better than the spruce and pine that I have been burning the past three or four years. As such, as soon as I see a birch that has died, I try to cut it down and process it as soon as possible. I found one close to the trail a week or two ago, and then tried to get it in one free morning. Unfortunately it leaned away from the trail. 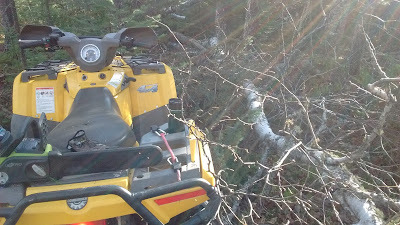 I thought I'd be clever and use the winch on the ATV to try to cause it to fall "uphill" and into an easier to access position. I didn't expect a) that the tree could reach the ATV, and b) that it would really fall very much towards the ATV. Obviously I was incorrect on both counts. As I saw it start to come over, I exclaimed "crumbs!" and rushed off perpendicular to the motion of the tree. Luckily it only brushed up against the ATV as it came to rest. I had to cut it up to be able to get back on the trail, but it was a valuable lesson. Just brushing up against it. 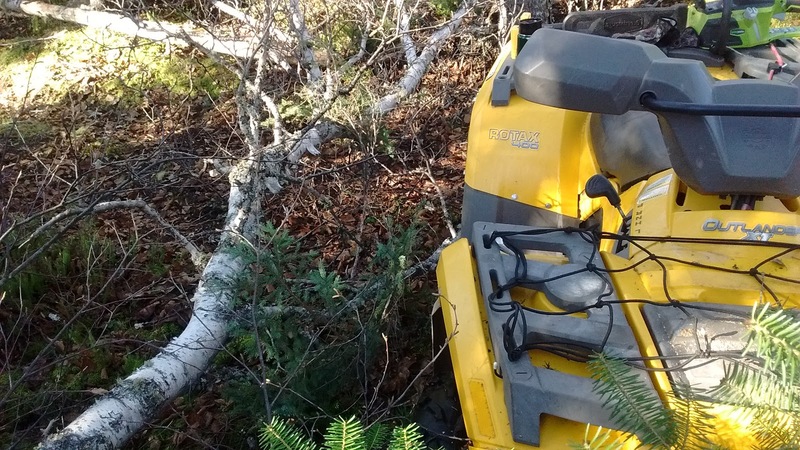 I guess it COULD reach the ATV. Rats, the trail is blocked this direction. Time to cut it up! Returning with my spoils after all.